Today is the Chinese New Year. And I forgot all about it! 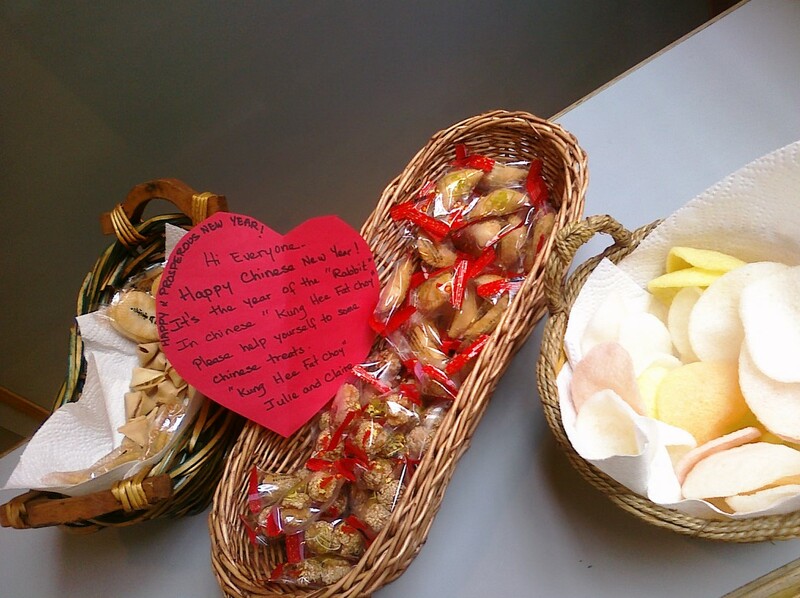 I arrived at work this morning to find baskets filled with goodies and New Year wishes “Kung Hee Fat Choy”. It is now the Year of the Rabbit. A lucky year that will be followed by my personal favorite, the Year of the Dragon, next year (I was born in the Year of the Dragon and find the creature to be fascinating, but I think that’s a blog post for another day. 😉 ). This year, though… THIS year is my son’s year. The Year of the Rabbit. A lucky animal, indeed. Several years ago, I began celebrating this holiday with my children, simply because we like to celebrate things and it’s a good excuse to eat Chinese food. Tonight’s dinner plans are now changed. The Tamale Pie will be frozen and can make it’s way onto next week’s menu instead. (It’s a lucky year already! I’ve got a dinner ready for next week, and it’s not even the end of this week, yet. 🙂 ) I will pick up some potstickers and some other of the kids’ faves on my way home. We would usually cook up a big Stir Fry, and had I remembered, I would have made some Chinese BBQ Pork as well. But tonight will be about sitting around and celebrating the New Year together with some fun Coloring Pages and crayons instead of making a mess of the kitchen. This entry was posted in Cooking With Love, Entertainment and tagged comfort food, cooking, family, freezer, friends, fun, holidays, home, kids, love, recipes. Bookmark the permalink. I read this nervously thinking you were going to share a recipe for rabbit stew!! Mmmm… Maybe Chinese take-away is in order for my evening’s meal.